Speeding Bullets is a Free-for-All minigame featured in Mario Party 9, and returns in Mario Party: The Top 100. The name is likely inspired by the Superman phrase "faster than a speeding bullet". This minigame and Smash Compactor are the only Free-for-All minigames to have unique music. The camera follows the captain as they pass over a dash zone, then splits to show all players. Players try to be the first to reach the finish line. Along the way, they will encounter dash zones, which increase their speed meter by one, and Piranha Plants in Warp Pipes, which decrease their speed to one. The faster the player is going, the bigger each movement will be. 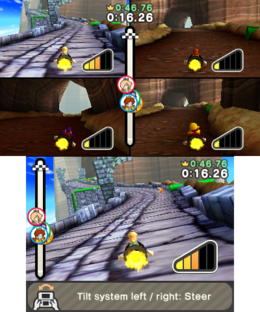 The bonus objective for this minigame in Time Attack mode involves passing over each dash zone. The first and second players to finish will cheer, while the third and fourth players will be disappointed. "Hold the Wii Remote sideways. Tilt the Wii Remote left and right to steer your Bullet Bill." Rules – "Pilot Bullet Bill to the finish line as fast as you can. Pass over dash zones to boost your speed. Hitting obstacles will lower your speed." Description – "Ride your bullet to the goal, dodging obstacles on the way!" On-screen – "Dodge the obstacles in a race for the goal!" Mario in the introduction to Speeding Bullets. Speeding Bullets, in Time Attack. The music that plays during the minigame, entitled "Freshen Up! ", is a slight remix of the original Super Mario Bros. theme. This page was last edited on March 31, 2019, at 13:50.